My mistake. I looked at this one. My apologies. I'm actually more familiar with the PSP version these days than the PS2 game (though I still have both copies). I am not familiar with the scenarios so your comment went over my head when I originally saw it, but I guess I could look at the procedure the game uses to load the scenarios and see if I can hijack it to point to the removed scenarios. They tend to remove code but keep the art around. There's still a chance it might work if the scenario is stored as a script outside of the game code. Reichu and Kira BB Yamato, you two are amazing! Data is 60.43% translated, Rodata is 21.26% translated! In just one day! This puts pressure on me to figure out IMTEXT.BIN as-soon-as-possible for you two to tackle while you're in the zone! Haha! Reichu#874260 wrote: As I've been going through rodata, I've been taking notes on what seems to be used for what. I'll update this post later, I guess. Hoping this is at least moderately helpful to Kira. I think it'd be much more easier on you to update the listing on GitHub. Reichu#874260 wrote: I've bumped into the honorifics that Kira mentioned. I think I was too focused on the smaller fields/menus being overrun, but I wouldn't mind keeping the honorifics, and then removing them later if things become an issue. Like it's also possible I may be able to tweak the game's font rendering to have it draw smaller text (no promises!). In which case we shouldn't be prematurely optimizing. It's also easier to remove all the honorifics if we change our decisions than it is to automatically add them back... you're right - keep the honorifics! Reichu#874260 wrote: 1) Expanding acronyms, or leaving alone? then it should be fine to do the same to English Eva fans. Reichu#874260 wrote: 2) Periods in acronyms? Not sure about this one. I'm leaning towards periods. that the periods are not needed in Japanese. so for English, visually, it makes sense to go with periods. Give the cookie to JA. Give the cookie to J.A. The prior with Roman letters looks like someone held the shift-key by mistake and capitalized Ja. Reichu#874260 wrote: 3) "Prog."? - The shortened form of "progressive", "prog", is regularly spoken out loud in dialogue, so I don't think the period is necessary. If there's an official subtitle approach to this, go with it. but Progressive is not common. So if one writes prog. it looks like a sentence end. I'd suggest leaving out the period. Reichu#874260 wrote: 4) JA2 vs JA Prime: The latter is some nonsense I made up years ago, prior to playing NGE2, via a very colorful misinterpretation of what the 'kai' suffix could be translated as. Got popularized because it was on the wiki for so long (and is probably still there...), but the game indicates that "Jet Alone 2" is what the thing should be called in English. Haha, that's awesome. If I had that power, I'd probably get everyone to call Asuka Asooka (like Bazooka with an s) instead of Oskah (like Oscar with an h). But afraid I'm going to suggest going with the official variant! Reichu#874260 wrote: 5) 心の迷宮 (kokoro no meikyuu) ... as "labyrinth of the heart", or more fluently, as "emotional maze". Go with the prior. It's so cool, we'll find a way to get it to work! Reichu#874260 wrote: 6) Name order in Asuka and Kyoko: Dan Kanemitsu handles the compound surnames by putting the Japanese one first, so it'd be "Asuka Soryu Langley" and not the more familiar "Asuka Langley Soryu". Since he actually works with khara, I like deferring to his choices when possible. Yeah I think it's best to go with Dan Kanemitsu's approach then. Reichu#874260 wrote: 7) Specifically Japanese concepts like numerous food items. Leave them alone or try to approximate? Would be a lot easier to just write "bento" than get clumsy with "boxed lunch", and so on. It's the Internet age and any dorks who end up playing this can easily look up anything that sounds too exotic. My gut with food says, if an English cookbook would call it a Bento, then use Bento. Reichu#874260 wrote: @All: Capitalizing every word vs. not, I think this depends stylistically on where the text is to be used. Namely, is something being labeled? (Ex. List of items or attack choices.) Or is it a sentence (or a dialogue fragment meant to be inserted into a sentence)? Kira BB Yamato#874270 wrote: Also, sensei, I've noticed that you're putting in \ for apostrophes. Thanks for bringing this up! I was fixing them manually and didn't mind since it gave me something to look forward to while proof-reading. I actually ended up looking at IMTEXT.BIN last night and have figured out the first part: the BIND header and how it works. Putting it in a spoiler if someone's technical following along, but not to bore others. The BIND header acts like a look-up table to various TEXT entries. followed by the size of the header (let's call it header_size):uint32. Then there's a list of "lengths", each sized according to the aforementioned index_length. This is all contained within the header_size. Next follows a bunch of block_sizes (think of them like evenly sized sectors on a disk). if the blocks are 32 bytes each, but an entry's length is 35 bytes long, that actually takes up two blocks and thus you need to skip 64 (32 + 32) bytes to get to the next entry. So now that I know how to get to a specific TEXT block, I need to know how to parse the TEXT block itself since the Japanese text is ordered in a certain way, and it's not just text in there, there's something else. The weird thing is that the act of opening a door reads from IMTEXT even though no texts appears when opening a door - BUT a sound does play. This leads me to believe that IMTEXT probably groups sound and text together. And AlfaSystems (I'd hypothesize knowing how lazy they are), for cases when a sound needs to play with no text, most likely makes a sound entry with zero-length text that pops up in an invisible dialog box. Knowing them, I think this is certainly the case. Will dig into it further. But in other news, holy heck! Awesome work you two! Keep it up! I know it's much too early to even think about beta testing, but I decided to take a look at how things were looking ingame. The results? Better than I expected, but some menu options seem to have arbitrary limits. For instance, "Discard Equipment" displayed as "Discard Equipme", despite "Sever Umbilical Cable" displaying just fine (might be an issue with loading a save state, but maybe not). This is going to be fun to beta test. The only change to the github I made as a result of this was removing the spaces I added to the character names to make them all line up, since that ended up being a really bad idea. You end up with Shinji, Gendo, Kozo Fuyu, Misato Kats. Just something really easy to fix that I messed up, so I felt obligated to fix it. Please forgive me! I added a bunch to that shorter file, but some lines I couldn't really understand. Somebody more familiar with the game might know more about those. Also, Reichu, you were confused about the two lines that had to do with skills? The first one listed work skill, study skill, and self-defense, and a pointer to the character's unique skill. For formatting's sake, we're going to want to add spaces to the beginning of each skill to make them all as long as the longest unique skill. The second line was for characters like Hikari who lack a unique skill. Kira BB Yamato wrote: I know it's much too early to even think about beta testing, but I decided to take a look at how things were looking ingame. The results? Better than I expected, but some menu options seem to have arbitrary limits. For instance, "Discard Equipment" displayed as "Discard Equipme", despite "Sever Umbilical Cable" displaying just fine (might be an issue with loading a save state, but maybe not). This is going to be fun to beta test. The only change to the github I made as a result of this was removing the spaces I added to the character names to make them all line up, since that ended up being a really bad idea. You end up with Shinji, Gendo, Kozo Fuyu, Misato Kats. Just something really easy to fix that I messed up, so I felt obligated to fix it. Please forgive me! I added a bunch to that shorter file, but some lines I couldn't really understand. Somebody more familiar with the game might know more about those..
Ahh so that's why you removed the spaces. The reason it varies is because the original Japanese text took up less space than English. But, there are also places where the Japanese took up more space than the English. These places create free space, so one can move sentences around in memory to take advantage of the reclaimed space. Yeah, I only did it so they'd line up with Asuka's name, but I forgot hers had a line break in it. If we wanted, we could format it so the given name was on one line and the family name on the other, but I'm getting ahead of myself. Holy hell, that's neat. Glad to see you're thinking ahead. As to be expected! Damn, that's a hell of an update, Kira! Most impressive. Just a few minor things I want to check and tweak. If they're major, I'll ask here first. BTW, if you see anything obviously dodgy or easily improved upon in my own work, feel free to tweak as well. - I'm pretty sure rendering しんどいことあるか！ as "Are you in trouble?!" is wrong. Now granted, I'm too dumb to be 100% on a translation myself, but based on the dictionary entry for shindoi, we're looking at something that fits into the "self-interrogation" theme of the Leliel encounters. - 心の補完観察 has its scenario(?) title in one file and its description in the other. The translations need to be synchronized. I'm not sure exactly what this thing is, so I don't know the best way to translate it. May need to revisit later. - Stylization for the "exploring the guts of Dogma" text. I went with a "You see a [whatever] and it looks like [whatever]" format, in the style of a text-based adventure game or what have you where the game is describing things to you-the-player/character. Kira went with a first person narrative instead. Is there's something implicit in the Japanese that indicates it's to be read in the first person? If not, I I think the other way is less jarring. There isn't any real inner monologuing in the game unless it's explicit from context (a cut scene mimicking NGE's weird mindscape stuff, for instance), whereas the game "talks to the player" all the time. The Dogma exploration text is also the same regardless of which character you are, whereas elsewhere the game goes to great lengths to personalize dialogue based on who's saying it. Only reason I can think of to simplify the "[verb] with [weapon]" form is due to space considerations, but a lot of them aren't actually that long. Plus if attack names are going to be simplified into noun phrases, why stop there? It feels kind of arbitrary to me, I guess. The results can often sound very Engrishy and/or muddled, as well. I'd prefer to translate it the way it's written unless there's a specific reason not to. Reichu wrote: - I'm pretty sure rendering しんどいことあるか！ as "Are you in trouble?!" is wrong. And you may be right. My train of thought was: "しんどい means tiresome or bothersome, こと is thing of course, and it's asking if somebody has it. Problems? Nah, trouble?" No objection here. My goal was just to get the meaning down, and even then, I'm not sure on the one about the mouse. - Attack descriptions. Is the simplification of, say, "Cut with knife" into "Knife Cut" being done on purpose? Actually thought about that when I tried getting into a battle. Definitely should be changed. "Sword Slash" is terrible and I don't know what I was thinking. "Swing sword" would be better, for instance. I think I was confused on the context originally due to the Misato instruction bits and thought it was describing actions. Like when a character talks to you and you get a small box at the top of the screen describing what they did. Kira BB Yamato wrote: Yeah, I only did it so they'd line up with Asuka's name, but I forgot hers had a line break in it. If we wanted, we could format it so the given name was on one line and the family name on the other, but I'm getting ahead of myself. It was a merge conflict that I had to resolve when Kira was using a separate branch. I ended up going with the noun phrases form because I was thinking how RPGs deal with things such as Magic Attack vs Attack with Magic. Length (in menus) was also a slight concern on my part. But you're right, we should focus on accuracy right now. So I've figured out the BIND/TEXT format, which means every source of text in the game has been figured out now. And the next one is a doozy, don't get disheartened. It's so large I had to split it into 5 parts. This is all the conversation text in the game. Now you may notice a difference in format of the above files compared to what you're used to. Just keep in mind that the Japanese is now BEFORE the ???. EDIT: The Japanese text has multiple \0\0\0\0, but you just need to put one \0 at the end. Wooo! Way to go, deeRez! I'm dying to know what's being said in a lot of the character scenarios, but for now I suppose priority should be given to more general-ish kinds of text? f2info is just the Classified Info text. I'll take care of that one! Good opportunity to give that translation the thorough comb-over it's needed for years now. On this subject, I'm curious as to how exactly we should translate 秘密情報. See, back before the PSP version came out, I translated it as "Classified Information". Then I saw that the PSP version actually had "Confidential Information" written in English in the background when you're browsing the C.I. screen. Do we go with what the English fanbase is used to by now (which would mean modifying the graphic, I guess), or switch over to what the game uses? An argument can be made both ways, so I'm a bit indecisive... but if there's any right time to make a switchover, I guess now would be it. I'd stick with Classified. I think English speakers will understand that they have essentially the same meaning without any problem. That's amazing. So much text! The dialog files have a lot of redundancy in the form of slight variations in phrasing. Do these correspond to the speech patterns of different characters? Is there any way to retrieve the speaker for each line of dialogue, or is that information buried in the game logic? There's a clear distinction as to whether it's a matter of a character choosing between different nuances (in which case the phrasing is very important, as it impacts game play), or whether it's just different characters encountering the same scene. Baz wrote: The dialog files have a lot of redundancy in the form of slight variations in phrasing. Do these correspond to the speech patterns of different characters? Each character (aside from Gendo, and probably Fuyutsuki too) has two different speech modes: casual and polite. Which one they use depends on who they're speaking to. E.g., Shinji talking to another kid: casual; Shinji talking to an adult: polite. Misato talking to a kid or to an adult of equal or lesser rank: casual; Misato talking to Gendo or Fuyutsuki: polite. Reichu wrote: Wooo! Way to go, deeRez! By the end of this, your and Kira's Japanese is going to be SOOO GOOD. which is why you shouldn't feel like you're on an impossible mission. Even if you do a routine of waking up and translating 20 lines a day - followed by eating a healthy and balanced breakfast - that's good enough. and finally add them to the README on GitHub along with a link back to a forum thread on here. Reichu wrote: I'm dying to know what's being said in a lot of the character scenarios, but for now I suppose priority should be given to more general-ish kinds of text? There's probably cut dialog, so eat-your-heart-out-kid! "There was a scenario where Gendo pilots the Eva!? Ieeeee?!" Reichu wrote: f2info is just the Classified Info text. On this subject, I'm curious as to how exactly we should translate 秘密情報. See, back before the PSP version came out, I translated it as "Classified Information". Then I saw that the PSP version actually had "Confidential Information" written in English in the background when you're browsing the C.I. screen. Do we go with what the English fanbase is used to by now (which would mean modifying the graphic, I guess), or switch over to what the game uses? An argument can be made both ways, so I'm a bit indecisive... but if there's any right time to make a switchover, I guess now would be it. Checking jisho.org - looks like 機密 is Classified Information while 秘密情報 is Confidential Information. so it's synonymous with Confidential/Secret outside legalese. Confidential Information is a specific category of Classified Information in legalese. to match the legal definition. This should be just discussing the scenarios, what they mean, etc. Move all these posts to the technical analysis (with a post at the end pointing the the new translation thread). the new translation thread has "Translation" in the title. This would be a blank new thread with a helpful first page like you said to give everyone a good footing. but empty/locked for now while we figure out what the heck to put as a first post. Baz wrote: Is there any way to retrieve the speaker for each line of dialogue, or is that information buried in the game logic? Possibly via the sound files, but not all things have sound files. The way the BIND/TEXT format works is that there's a block of sentences with an unknown_first and unknown_second number. Then there's another block that pairs a sole unknown number to one of the sentences in the above block. while the sentence + unknown_first and unknown_second are reused. so they don't see * most * of the duplicates unless of course the duplicates have slight variations (as you've spotted). If I can figure out what those unknowns are, then yeah, I'll find a way to provide that information to the translators. Though on the other hand, I assume it's saying what sound to play, but then it doesn't make sense since multiple phrases share the same sole unknown number, unless the sole unknown number selects the speaker, while unknown_first and unknown_second select the phrase underneath the speaker. Reichu wrote: Each character (aside from Gendo, and probably Fuyutsuki too) has two different speech modes: casual and polite. Which one they use depends on who they're speaking to. E.g., Shinji talking to another kid: casual; Shinji talking to an adult: polite. Misato talking to a kid or to an adult of equal or lesser rank: casual; Misato talking to Gendo or Fuyutsuki: polite. Huh, you think people will have issues with casual vs formal? That's some Intermediate Japanese I stuff right there, but then, considering the quality or lack thereof for my translations, maybe I shouldn't be talking. Either way, we're in a real good position now, thanks to you. I'll do my best to put out as much as I can, but I'm going to be fairly swamped this week - three Japanese quizzes and two programming exams, as well as a programming project that I need to salvage because it's a total wreck right now. @deeRez: I'll write a more thorough response later, but just one point: the cut scene dialogue still appears to be missing. Any word on the status of cracking that? Reichu wrote: @deeRez: I'll write a more thorough response later, but just one point: the cut scene dialogue still appears to be missing. Any word on the status of cracking that? 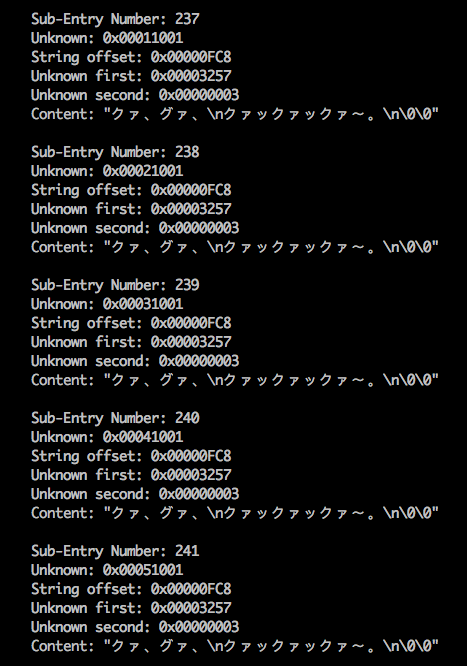 The nonsense characters are cause I'm reading all the text in the file as Japanese. Junk becomes junk, actual Japanese becomes actual Japanese, but key part is that yes it looks like there's Japanese text in there. So yes I'll need to start figuring out this EVS format, which might be a scripting language. 00000130: 82bd 8142 0a83 8d83 9383 4d83 6b83 5882 ...B......M.k.X. 00000140: cc91 8482 f08e b882 c182 bd8d a181 410a ..............A. 00000160: 82cd 8f6f 9788 82ca 8142 81a4 0a97 4288 ...o.....B....B. 00000170: ea81 4183 8a83 8a83 5882 cc95 aa90 6782 ..A.....X.....g.
Looking through btimtext, it has a whole bunch of different stuff. I'll write up a guide for whatever I can ID. (Just noticed the lack of hexadecimal... whatevers. Huh.) Further support, BTW, for your suspicion that Alfa linked sound files to text. There's text here for all the pilot voice clips used in the battle animations, even though no text accompanies these vocalizations in-game. Here's an example of what I mean (this one is これでも食らえ！！ in bimtext).